Welcome to the 21st edition of my BullCharts software Tip Sheets, focusing on tips and hints for BullCharts (the Australian charting software package). 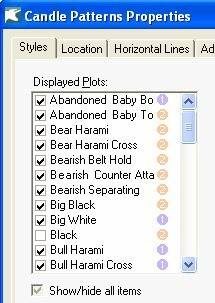 I am sending this Tip Sheet to both the BullCharts users and my Toolbox Members for interest. I had one of those "ah ha!" moments this weekend when I realised a very effective way to easily handle candlestick patterns (this happened while I was doing my weekly market analysis for the Weekly Market email that I send to Toolbox Members). We can follow the steps below to quickly learn more about all those fancy candlestick patterns, and work out which is which. So this Tip Sheet concentrates on two things "Candlestick Patterns", and the "BullCharts Layer Manager". Yes, the Layer Manager! Don't forget I am now an authorised BullCharts reseller, offering free tuition to those who purchase through me. So encourage others to visit the BullCharts section of my Share Market Toolbox web site so they can benefit from the special offers (my Toolbox is an arsenal of weapons to help you tackle the share market). Many people feel that candlestick charts are easier to read and interpret than bar (OHLC) charts. If you are starting out, you might still be a little puzzled about how to read the humble candle. That's okay, everyone has to start some where. So, what is the difference between the black candles and the white ones, or the red ones and green ones? Or perhaps you are trying to understand how to interpret the open price versus the close price. Take a look at my new web page (still in basic form, but will be expanded) - How to understand candlestick price charts. It is basic, and might help you. 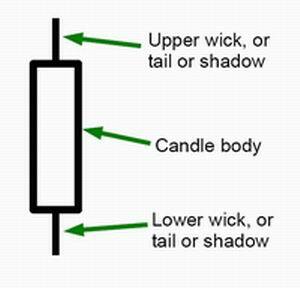 There are a myriad of candlestick patterns, and there are specific "shapes" and corresponding names for single-candles (eg. 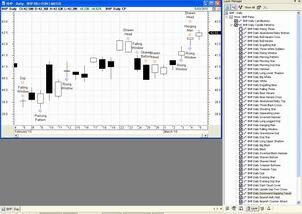 doji, marabozu, shaven...), as well as many multi-candle patterns (3 black crows, Rising Three Method,...). And they all have their own unique names. To see more a lot more detail about pattern names, see the link above to my simple Candlestick page, and the "Useful Links" section on that page. BullCharts includes a Candle Patterns indicator. My Toolbox Members will know that I wrote a 5-page eBook Article about it a couple of months ago - BC-08-200, "BullCharts Candle Patterns Indicator" (available to my Toolbox Members). It names just some of the more common candle patterns, and explains this BullCharts indicator. If you are not a Toolbox Member, you can see page 1 of the eBook Article here. In the rest of this Tip Sheet, I will assume that you know how to "Insert" this indicator onto a BullCharts price chart. If not, it is just like any other BullCharts indicator. You can refer to the eBook Article. Okay, open up BullCharts, and create a new price chart (eg. for BHP), then "Insert" the Candle Pattern indicator (see my eBook Article mentioned above). Note that it might take a few seconds for BullCharts to work through your price chart, and identify the candle patterns to flag. Also note that by default this indicator only flags a handful of candle patterns. To display more patterns, or fewer, you need to view the properties of the indicator, and tick or untick the checkbox for each of about 50 candle patterns. But it is easier to do this using the Layer Manager (the details are below). Now, open up the Layer Manager, and your chart might look like the one in the accompanying screen shot (click on it for a larger image). If you are not sure about the Layer Manager, I have not yet written a Tip Sheet about it (perhaps I should have). But I have written a 4-page eBook Article, BC-40-100, "BullCharts Layer Manager" (available to Toolbox Members), or non-Members can see page 1 here. (In the Control Panel / Security Manager, note the tabs across the bottom - it is usually the fourth one. Don't forget that the Layer Manager (introduced in BullCharts v3.8), is actually within the Control Panel window pane which can be re-sized by dragging the left-hand border to the left or right. You can also grab the Title Line in the Control Panel, and move it towards the centre of the window in order to "undock" it from around the edge of the BullCharts window. Okay, we have BullCharts open, and a price chart of a stock with the Candle Pattern indicator displayed, and the Layer Manager open. So, what's the big deal? Well, if you want to display or hide specific candle patterns, you normally need to view and change the Properties of the indicator (as I mentioned above). OR, the easier way to do this is to look at the Layer Manager window pane (see the accompanying screen shot - click on it for a larger image - and then zoom in to see more clearly), and simply tick or untick the required boxes. Make sure to wait a few seconds for your computer and BullCharts to work through all the known patterns (watch for the small information message "Calculating..." in the top left corner of your BullCharts screen). If you have an interest in a specific candle pattern, you can zoom your price chart out to view a lot more history, and simply select the pattern in the Layer Manager. If you are interested in learning more about many of these candle patterns, you can do the same thing. Simply work down the list of patterns in the Layer Manager, and tick them on/off one at a time (or three or four at a time). Want to learn more about the share market? or about that ginormous topic of charting? Blue Chip Price Chart Secrets seminar. You just can't afford to miss either these. They are happening very soon - in a week or so. Session details, dates, costs, venue, etc. are on my web site here. And I am currently offering some special incentives to encourage you to come along to a seminar - see the Special Discount details here. At this stage there are no BullCharts training workshops planned (there does not seem to be enough interest). If you are interested in a topic, please feel free to contact me to discuss the options. 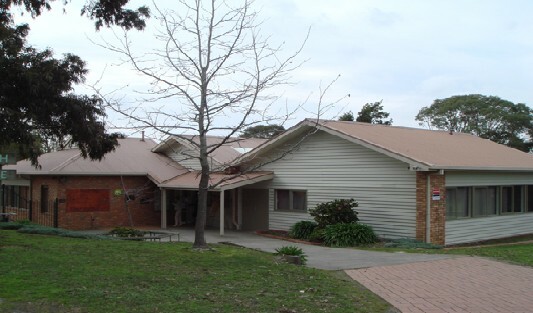 The regular venue I now use for most sessions is the Vermont South Community House (VSCH). To enrol for any of these, you need to contact the VSCH directly by phone or email. If you have any questions, please feel free to email or phone me (or catchup at a BullCharts User Group meeting, or an ATAA meeting - I am now the Victorian Chapter Vice-President, and a National ATAA Board Member). This email was sent to .net.au by robert@robertbrain.com.